Author: Siegel, Sheldon Set In . . . Description: Fate throws a curveball at the San Francisco ex-husband-and-wife legal team of Mike Daley and Rosie Fernandez, when Mike picks up the phone and hears the voice of Leon Walker. This is not good news-because Walker was the one who ruined their marriage. Years ago, he and his brother participated in a stickup that left a man dead. Through a series of (some said) questionable maneuvers, Mike got the charges dropped, but he and Rosie fought about it all the time and it finally drove a wedge between them. Now, a Silicon Valley venture capitalist has been found dead in a dumpster on San Francisco's skid row. The new murder has been pinned on Walker, but he not only tells Mike he is innocent, he says he is a dying man and doesn't want to go to his grave proclaimed a murderer. Dogged investigation, courtroom nimbleness, and a healthy dose of luck usually have helped Mike before, but it looks like it'll take more than that to prevail this time, and his time is running out-both on his client and, just maybe, on his partnership. 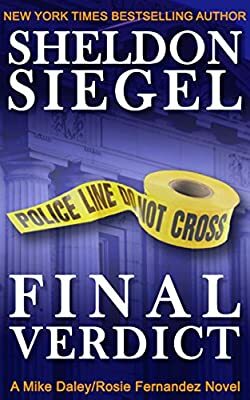 FINAL VERDICT is book 4 in the NY Times and Amazon bestselling legal thriller series featuring Mike Daley & Rosie Fernandez.